If you are a writer with a book project, book proposal or complete manuscript, you absolutely must have a website. Why? Publishers and readers demand it. The world must be able to find you on Google. Writers need a professional online presence, beyond the personal Facebook profile and e-mail account. If you are going to publish, you need to have a public persona. Not the celebrity kind – don’t fret! Just the normal writer kind, like Swenson Book Development, LLC favorite writers Heather Lende, Cathryn Prince, and Ithaca’s very own local writer-in-residence, Eleanor Henderson. Still grumbling over the Internet? Get over it. This is the Age of the Digital Author: it’s time to put in the effort or pack up the pencils. Smart writers have a website. But they also should be blogging to keep readers up to date about their book, as well as any pertinent writerly interests, public appearances and general career updates. Don’t be humble, now: a writing career doesn’t just include a WIP or finished manuscript, but also any other previously published books, articles, essays, videos, speaking engagements or lectures, and interviews. ... this better NOT still be a question, writer friends! As a writer with a website and blog, you need to habitually provide content to keep readers interested and keep your website relevant to search engines and feed caches. What should you blog about? Ultimately, dear writer, that is up to you. Though there are many blogs out there on writing catchy and successful blog posts, there is no one surefire combination. Just keep in mind that blogging is writing and writing is what you do best, so do it. A small yet necessary warning, writer blogger: you are writing for an audience. Don’t bother blogging if you don’t want the public attention. Better yet, don’t write a book if you don’t want public attention. (Yes, really.) Blogs need readers and comments. No readers and no comments makes your writer blog a writer diary. How do bloggers find readers? Ones who leave comments? Again, there are many appealing how-to articles and online tips, but there is no magic potion. The honest answer is also the simplest: self-promotion. You need to share your blog and your posts with people. You need to share your post after you publish it and provide a way for readers to get new posts easily and conveniently. Depending on your particular website or blog platform, you have options for sharing your blog posts to reach readers and build a devoted audience. Whether you are reaching out to readers on social networks or through an e-mail campaign, there are tools to make self-promotion quick and painless. 2. Don’t become over-zealous with self-promotion. Don’t forget readers are human, seeking out genuine interactions. Sharing links or posting updates only about yourself tells the Internet you are self-absorbed and a little desperate. Don’t be desperate. Mix in fun videos, links to other websites, and honest opinions about current or topical events. 3. Be consistent. Once you start sharing your work online, maintain activity. You won’t build a devoted audience from a dozen links. Stick with a platform, stick with a network and stick to your guns. Loyalty matters. The easiest tool for self-promotion and sharing new blog posts online from any platform is the Bit.ly link shortening service. Bit.ly is free and easy to use. The service tracks clicks on your shortened links and makes it easy to re-post and re-share older links multiple times. Use the Bit.ly bookmarklet to shorten your permalink, copy the shortened URL, and paste it to your website of choice. You can share the shortened URLs on Twitter directly from the Bit.ly dashboard or on your Facebook Page when posting a status update. You can also create a hyperlink with the shortened URL in an e-mail or in a comment on another writer’s blog. Anywhere you can share a link, bit.ly helps you track its reach. WordPress: Go to Appearance > Widgets. Drag an empty Text Widget to your active sidebar. Place it near the top, above pre-exisiting widgets for readers to find easily. Copy and paste the Feedburner HTML code into the empty text box of the Text Widget. “Update” the widget to save. Jump-in-Sites: Navigate to the edit screen of your blog page. Go to the “Add Content” menu and select the HTML snippet. Drag this snippet to the right of the column for your blog posts, where a bright green space appears. Edit the HTML snippet area and copy and paste the Feedburner HTML code into the text area. Save your changes. 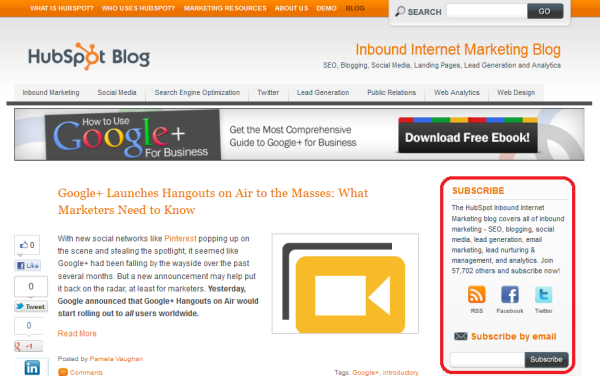 Thanks, HubSpot, for this example of a subscription sidebar! Why should e-mail subscription boxes appear on the top on your blog page, to the right of your posts? The top right section of a blog has become the standard and commonplace location for e-mail and social media subscriptions. Easy to spot, easy to subscribe. It’s one of the first things a reader sees, on the periphery of your post’s text. What if you want to feed your blog posts quickly and easily to your social networks, which little to no effort at all? This is a bit trickier and may require tech-savvy. The free internet dashboard HootSuite can help you share posts to social networks. This tool allows you compose and schedule messages that will publish at a future date (generally, offline) and view multiple social network feeds from a single screen. Hootsuite can connect following social networks: Twitter, Facebook (profile, page and group), WordPress.com, LinkedIn, Foursquare, MySpace, Ping.fm, and mixi. With Hootsuite, you can schedule a message with a link to your blog post to publish once a day, everyday, until you write a newer post. Effort is required, but Hootsuite offers simple and effective automation. Jump-in-Sites does not have automation tools yet, nor synchronicity to existing tools like Hootsuite or Bit.ly, so you have to share posts to Facebook, Twitter and other social networks manually. Sharing permalinks from your Jump-in-Sites blog are smartly leveraged with Bit.ly links, however. If you have to work to self-promote, work smarter (not harder). If you have a WordPress blog, I recommend downloading the Facebook Page Publish plugin or the Publicize plugin, to automatically share published blog posts to a Facebook profile or page. WordPress also has options for sharing blog posts to Twitter automatically. Installing and activating these plugins in WordPress is generally simple. Authorizing them for the social networks, however, can prove troublesome. Step-by-step instructions are available to make the process easier, but having a tech-savvy person available to help doesn’t hurt either! Test out your self-promotion options and see which tool you like best. Just keep in mind, however, that sometimes it’s best to keep things simple and do it the old-fashioned way: yourself. Author Platforms, Social Media, Technology, Writer Resources age of digital author, automation tools, Bit.ly shortened links, e-mail subscriptions for blogs, free tools and resources, Google Feedburner, HootSuite, Jump-in-Sites blogs, share permalinks, Wordpress blogs, writer blogs. Permalink.